A review of standards used to specify Indoor Sport Surfaces in North America | ASET Services, Inc. Note: In a recent article, a colleague commented that current test standards should be used in specifications. I developed this as a general overview of the standards that are commonly used within North America. It summarizes current standards and what I’d call ‘dead standards’ which have had their official status removed and are no longer being updated to reflect current technology. When I was introduced to the sports surfacing market as a graduate student more than 20 years ago, it was relatively simple. 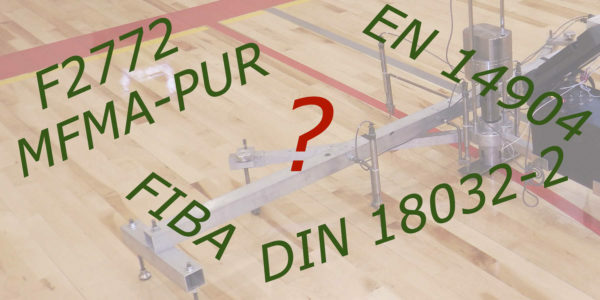 The only standard used to quantify performance of indoor sports flooring in North America (basketball, volleyball, aerobics, and fitness) was DIN 18032-2 (1991). Since that time, the market has evolved and the number of options used to market, promote and specify performance has exploded. I suspect that the market is full of owners and architects that go blank as we hurl what is the equivalent of alphabet soup at them; DIN, EN, ASTM, MFMA, and FIBA. The alphabet soup thickens when we start throwing around individual standards like F2772, F2569, F2117, 18032-2, 14904, etc. This article won’t provide all of the answers but it is a start to understanding the current options and some of the benefits and weaknesses of various standards. First, let’s start with the good news, and that is that there is significant common ground within many of the standards. For the most part, these standards use what has become a common language and they use essentially the same equipment and methods. What does that mean? Force Reduction (aka shock absorption): When force reduction is reported, that value will be the same for EN 14904, ASTM F2772, MFMA-PUR, and FIBA. A force reduction of 50% in an EN 14904 report is the same as it would be in these other standards. (DIN 18032-2 produced very similar numbers. The only difference is that DIN contains language about testing a reference surface to obtain a correction factor. The other standards above have been modified to eliminate the need for that correction factor. This may cause some DIN values to be 3-5% different than the other standards mentioned in this article. ASET found that obtaining a reference sample to set our correction factor was essentially impossible for a North American lab. Ball Rebound: When ball rebound levels are reported, the value will be the same for FIBA, EN 14904, ASTM F2772 and the MFMA-PUR standards, as all perform ball rebound tests exactly the same. These standards measure the rebound height from the bottom of the ball. DIN 18032-2 measures the rebound height from the top of the ball. This small difference means that DIN 18032-2 values are normally 1-3% higher than any of the other standards on the list. Vertical Deformation: When vertical deformation is reported, the value will be the same for EN 14904, ASTM F2772, MFMA-PUR, FIBA and DIN 18032-2. Each of these standards establish different acceptable minimum values, classes, and uniformity ranges but the value is the same regardless of the standard used. Area Deflection: At this time DIN 18032-2, MFMA-PUR and FIBA are the only standards or rules that require this property to be measured. The equipment used in each standard used is identical. The 1991 version of DIN 18032-2 only required area deflection to be measured in 2 directions. DIN 18032-2(2001), MFMA-PUR and FIBA require measurements to be made in four primary directions around the test point. ASTM F2772 and EN 14904 do not currently measure this property. A previous post examined the Area Deflection property and how most of the standards mentioned have elevated it to the most important property of a sport surface. In North America, the use of these standards is optional and each owner and architect selects the one that they feel is the most appropriate. I cannot tell you which one to select but I can offer a few facts about these standards. DIN 18032-2 is what I call a ‘dead’ standard. This standard has been withdrawn and is no longer active. It became inactive upon the ratification of EN 14904. As an inactive standard, it is not undergoing any maintenance to keep the equipment, methods and requirements up to date. A good example of that is the point I made earlier where all of the other standards have been improved so that the ‘correction factor’ is no longer needed. Given these facts I think owners and architects should think twice before using it and should give the other standards careful consideration. During the development of DIN standards, input was limited to German user groups, labs and manufacturers. This is because it was a national (not international standard). Some portions of this standard may have been based on excluding competing products from other countries rather than advancing safety and performance. EN 14904. This standard is active in Europe, and a group of European manufacturers and labs are involved in revising and updating the standard. This standard and those that it references are active standards. Owners and architects that use this standard in their specifications need to remember that all North American labs, manufacturers and user groups are excluded from participating in the development of EN standards. There are large multinational companies selling sport surfacing in North America that are involved to some degree in the development of EN standards. ASTM F2772. This standard and those it references are active and are regularly updated. ASTM F2772 also addresses both wood and synthetic indoor court performance. ASTM has the most open membership and the widest array of members involved in the development of their standards. Membership to the F08 Subcommittee on Sports Surfaces and Equipment is open to all manufacturers, labs, and user groups (such as the NCAA). Members that review this standard include manufacturer representatives from the synthetic court, wood court, running track, tennis court, synthetic turf and playground surfacing industries as well as 3rd party labs and those with a general interest in sports performance. ASTM has a strong international membership, and like the EN committee their standards are referenced worldwide. FIBA Rules. These performance rules are active, and are regularly updated. The methods and requirements are similar to the 2001 version of DIN 18032-2, but less restrictive. The FIBA rules have sections that apply to both wood and synthetic indoor courts. In many ways, the development processes used by FIBA are similar to the EN. However, FIBA does allow some North American manufacturers to participate in the development of their standards. They limit that involvement to manufacturers who pay significant membership fees to the organization. MFMA-PUR. The Maple Flooring Manufacturer’s Association (MFMA) developed their PUR standards. This collection of standards is active and it is regularly revised. The PUR Standards are also similar to the 2001 version of DIN 18032-2. These PUR standards were developed exclusively by the mill members of the MFMA. These include the six maple flooring mills located within the USA. MFMA membership is limited to manufacturers based in the USA. While the MFMA sometimes solicits feedback from labs, the 6 mill members make the ultimate decision regarding what tests are included in the standard and what performance levels are required. The MFMA and its members have a vested interest in selling sport floors, and the decisions may be based on marketing and sales rather than purely on advancing safety and performance.